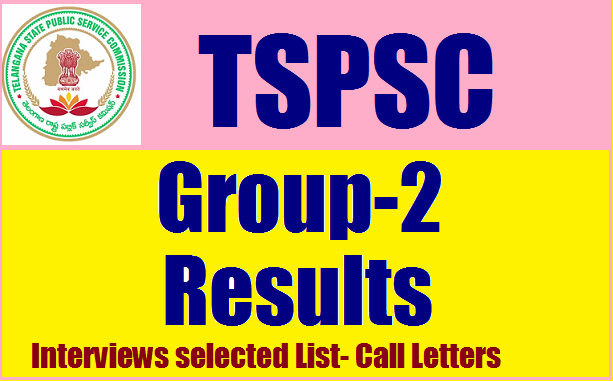 TSPSC.GOV.IN TSPSC.GOV.IN Group 2 Results 2017 Cut Off Marks, Merit List selected List for Interview Call Letters www.tspsc.gov.in TSPSC.GOV.IN Group 2 Results 2017 Cut Off Marks, Merit List selected List for Interview Call Letters www.tspsc.gov.in TSPSC Group 2 Results 2016-17 : Telangana Public Service Commission TSPSC is going to publish the exam results of TSPSC Group 2 Exam on their website very soon. Candidates who have appeared for the Group 2 Exam held on 11th and 13th November 2016 can check their TSPSC Group 2 Results using the link provided in this post. Going tinto details, TSPSC has invited applications from job seekers to fill 1032 Group 2 services vacancies. Many aspiring candidates have registered for the notification through online mode. After that, all these applicants have downloaded hall tickets and sat for the written examination held a ta various examination centers across Telangana State. In this post we have provided you with useful information about TSPSC Group 2 Result 2016, TSPSC Group 2 merit list, cut off marks. 1. It is hereby notified that on the basis of the Written Examination held on 11/11/2016 and 13/11/2016 to the various posts under Group II Services, the candidates with the following Register Numbers have been provisionally admitted in the ratio 1:3 for the verification of Certificates. After verification of original certificates, provisional list of eligible candidates for interview (Oral Test) in terms and conditions of the above notification will be announced separately. 2. The candidates who are admitted for the verification of Certificates are required to produce the Original Certificates along with one set of Photostat copy duly attested by Gazetted Officer, relating to Age, Qualifications Community (Integrated) , Latest Creamy Layer exemption certificate in case of B.Cs as per Memo No.3009/BCW/OP/2009, Government of Telangana, Backward Classes Welfare (OP) Department, Dt:18/12/2015 (prescribed format hosted on website), Certificates relating to claim of age relaxation, Study (from 4th class to 10th class) and if any, at the time of verification of certificates, failing which, they will NOT be admitted in subsequent process of selection. No request will be entertained for subsequent submission of any of the above certificates. In terms of the notification, the candidates should possess the requisite qualifications as on the date of notification. 3 The verification of Certificates will be held at Stanley College of Engineering & Technology for Women, Chapel Road, Abids from 12.06.2017 onwards. Day wise Schedule of the verification of certificates will be hosted in Commission’s Website on 02.06.2017. The candidates are requested to obtain and keep ready all the certificates as mentioned in the Notification. 4. If, on further Verification it is found that any candidate is NOT eligible with reference to the particulars furnished by him/her in the Application Form / Check List / Certificates, the results of such candidate / candidates shall be cancelled at any stage of selection process. 5. In respect of posts of Prohibition & Excise Sub-Inspector (Post code No: 5), the candidates have to undergo a Medical Examination before the competent Medical Board at Hyderabad and the P.H. Candidates have to undergo Medical Examination at respective Medical Boards. 9.#TSPSC 273 Deputy Surveyor Posts 2017 Recruitment in Survey, Settlements and Land Records Department. Telangana Public Service Commission, shortly called as TSPSC, was established by Telangana State Government in the year 2014. The commission is responsible to select applicants for civil service jobs in Telangana state. TSPSC has previous released Group 2 Notification to fill up 1032 various posts. Huge number of job aspirants from Telangana State has utilized this opportunity of employment and has applied for this notification. As a result Commission has received a huge number of applications from various regions of Telangana. Officials of TSPSC has planned to conduct a written examination, so that it can filter merit candidates from huge list of applicants. As planned, commission has announced the exam date and published Group 2 Hall Tickets. Commission has conducted written examination for all the applicants on 11th and 13th November 2016 at various centers. Continuing , it has published the official TSPSC Group 2 Answer Keys on its website. All the applicants have downloaded the keys and verified their answers. Now job seekers are eagerly waiting for TSPSC Group 2 Results release date, to check their score. Follow the step by step procedure mentioned below to reach the official portal and results page. According to the official announcement, a massive number of candidates have taken TSPSC Group 2 Written Examination at various exam centers all over Telangana State. The board authorities will shortlist the Job seekers by examining their capabilities through written examination & interview. Aspirants who have participated the APPSC Group 2 written test can download the TSPSC Group 2 Result 2016 Merit List on the main portal i.e., www.tspsc.gov.in. Job Hunters who satisfy the TSPSC Group 2 Cut off Marks are eligible to attend the interview. Candidates are in a tension to assess their TSPSC Group II Result 2017 to know whether they are qualified or not. Hence, applicants must be patient until the board release the official site. We will update the Telangana PSC group II Results link on the below sections. Keep visiting our site regularly for the latest Sarkari Results. Ratio for each Post: 484 candidates for 1 Post. Now, Enter your roll / Registration Number and DOB/Password. Then, click on the submit button. A new window will open having the TSPSC Group 2 Result. Finally, Take a printout of the Merit List 2017. At last, preserve it for the future purpose.